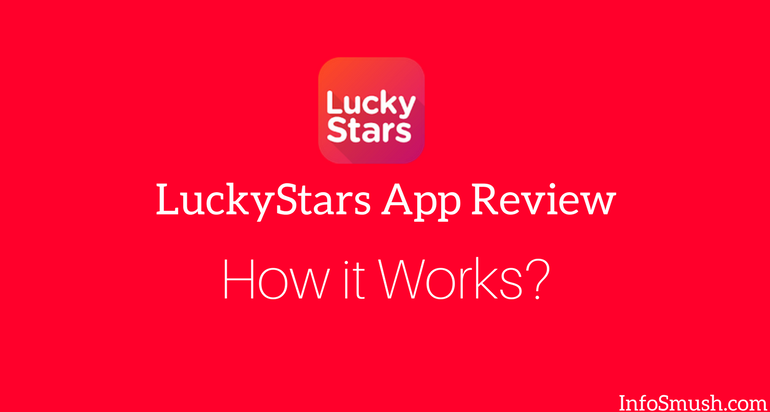 LuckyStars is an app which lets you win various gift cards, products and cash prizes for free. LuckyStars is an Android app for users in India to win various prizes by participating in quizzes and making bids. 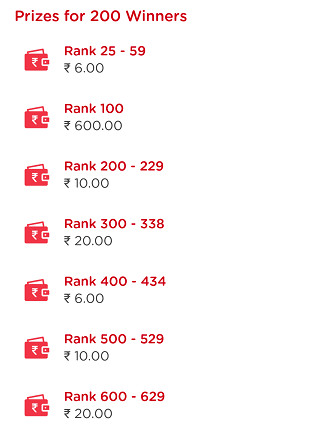 You can also earn paytm cash by predicting for cricket & Tennis matches that are occasionally added in the SportsQ section. 2. Skip the intro, enter your mobile number, accept the terms and conditions and tap "Continue". 3. Enter the OTP to verify your number. 4. On the next screen; enter your First Name, Last Name, DOB and this referral code: 8146974726. Make sure your details match with your ID cards(Adhar card, PAN card). 5. Tap on the "Continue" button and you'll receive 10 Coins. 6. Now go to "Profile", enter your email address and verify to receive another 10 coins. Make sure you enter the referral code otherwise you'll only get 10 coins for signing up. 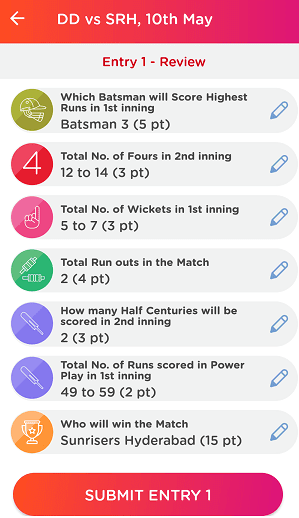 Now you can start playing quizzes and bidding. 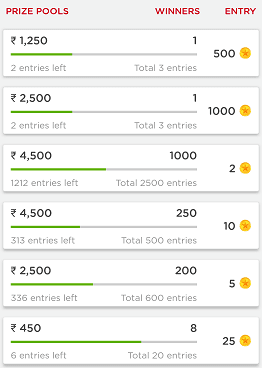 There are 3 types of contests you can participate in to win paytm cash and prizes- Quizzes, Bids, and SportsQ. You can earn stars by playing free quizzes and watching video ads. You can earn 300-500 stars per video. then tap the transfer arrow(⇋). It is in the top right corner. Now, enter the mobile number and the number of stars. You can send/receive up to 50,000 Stars. Coins are used to play paid quiz and place bids. You can earn coins by referring your friends. You can also transfer coins to someone else's account. Spin & Win: With Spin & Win, you can win Stars and Coins. You get 1 spin every day. Scratch & Win: You will win coins when you match 3 of the given symbols. You can only scratch once a day. Invite Friends: you and your friend both earn 10 coins when they enter your referral code. You can also buy coins. 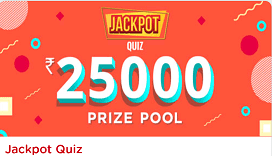 LuckyStars has recently started a new quiz called Jackpot Quiz. The prize money in this quiz is Rs. 25,000 and is free to enter. The quiz starts at 8pm and has 12 questions. You'll get 10 seconds to answer each question. To win the prize you need to answer all the questions correctly. If you choose a wrong answer you'll still be able to play if you have lifelines which you can get by referring users to the app. You can only use 1 lifeline per quiz. If you find a question difficult to answer you can swap the question with another for 5 coins. You can swap questions 25 times. The prize money will be split and shared equally among the users who answer all the 12 questions correctly. The quiz ends after 2 hours at 10pm. Well, it is free to play... Obviously. In free quizzes with product prizes, there is only 1 question and you can make 3 attempts. The winner is drawn by the computer. In Cash prize quizzes you'll be asked 3 questions and prize depends on your rank. Don't worry you don't have to pay anything from your pocket. For every Quiz, you'll be charged 1-2 Coin. You can play as many times as you want but every time you play the quiz, you'll have to pay coins. Mostly, there are 3 questions and you have 10 seconds to answer each question. 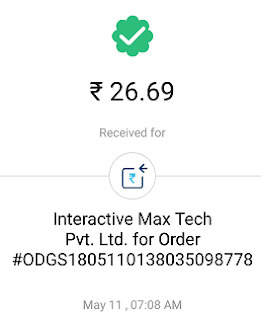 In these quizzes, you can win Paytm cash. It quite works as WinZO. The amount of cash you win depends on your rank. Your rank can change based on the participants who play again to change their ranks. 1 bonus point for remaining time in milliseconds for each right answer. Every day you can play 2-3 quizzes. 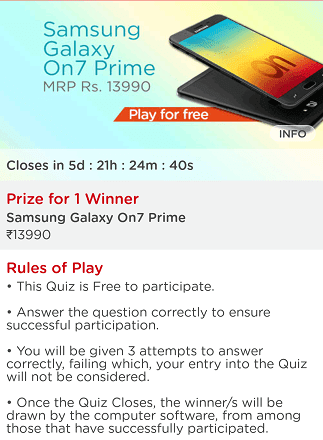 Each quiz has different prize pool and number of winners. 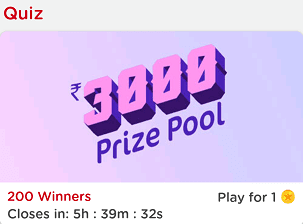 For example; the prize pool of the quiz in the screenshot below is Rs.3,000 and there are 200 winners. By making bids you can win products like Samsung Galaxy S9, Amazon gift card worth Rs. 10,000, Honor 9 and much more. Make the lowest unique bid. It means your bid should not just be the lowest but also unique. The bid you make must not already be made by anyone else or after you have placed your bid. So, yes everything depends on luck. 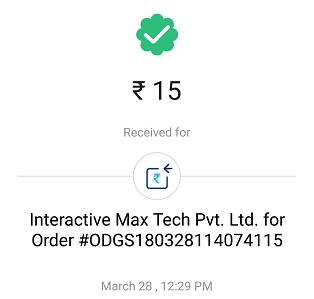 You can also earn paytm cash by playing prediction game for Tennis, Football and cricket matches that are added in this section. All you have to do is select a match from the home page of the app and choose a Contest. Each contest has an entry fee. You have to pay coins for every entry. After selecting a contest answer the questions(predict) and hit the submit button and pay the required coins to join the contest. The higher your rank is the more cash you'll win. You can change your predictions before the timer hits 0. You can also take multiple entries into the same contest. For every friend enters your referral code you both get 10 Coins. To receive your coins you must verify your email ID. Is Lucky Stars Legit or Scam? There are mixed reviews on play store. But, almost all negative reviewers say that they have not been able to win. None of them say that they won but did not get the prize. So, yes LuckyStars is a legit app. The only issue with the app is that if you can't refer a bunch of users you can't participate in most of the quizzes as almost all of them require some entry fee. And in Spin & Earn you'll mostly win stars and Scratch & win will only get you 600-1000 stars.